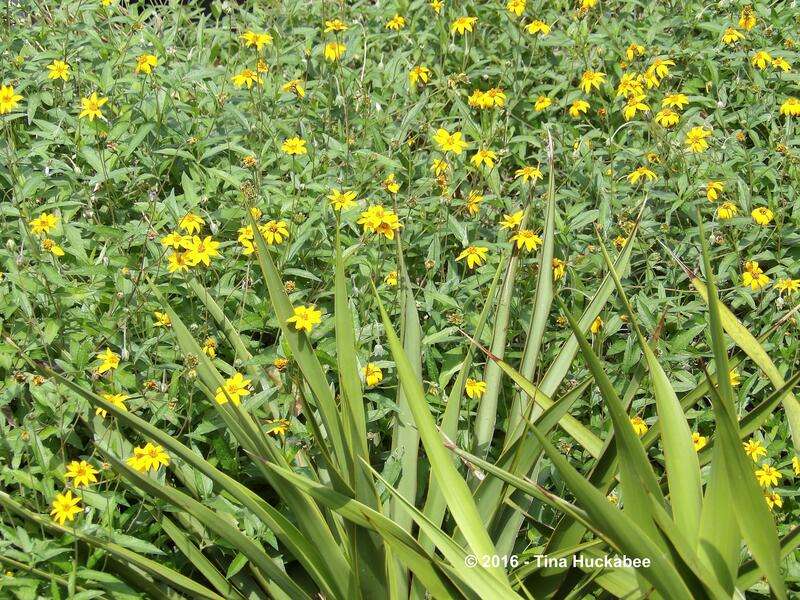 This week marks the annual celebration of Texas Native Plant week, October 16-22. 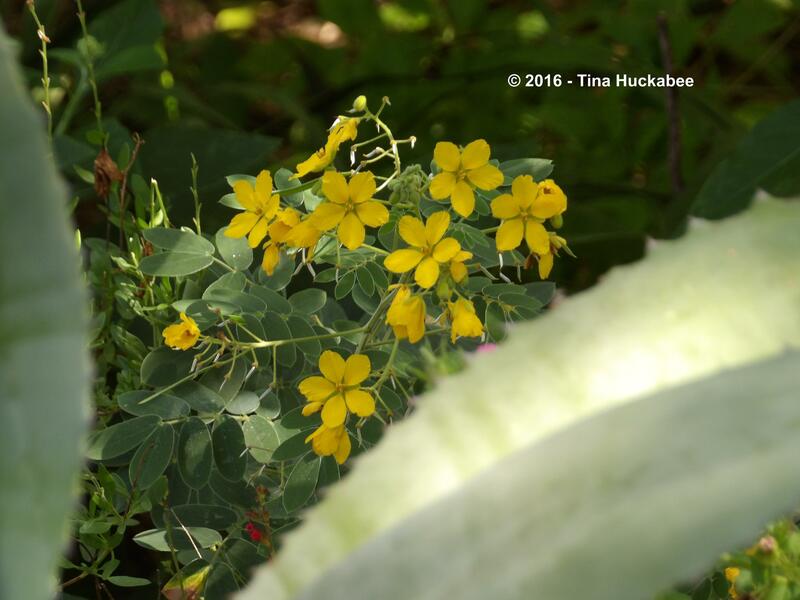 Two Texas natives, Lindheimer’s senna peeking through an American century plant, demonstrate the soft and the prickly of plants from the Lone Star State. Texas is well-known for its spectacular spring wildflower show and especially its star wildflower and state flower, the Bluebonnet, Lupinus texensis. But September, October, and November display an equally stunning array of beautiful grasses, annuals and perennial bloomers, as well as colorful seed and berry-producing plants during the beautiful autumn display. 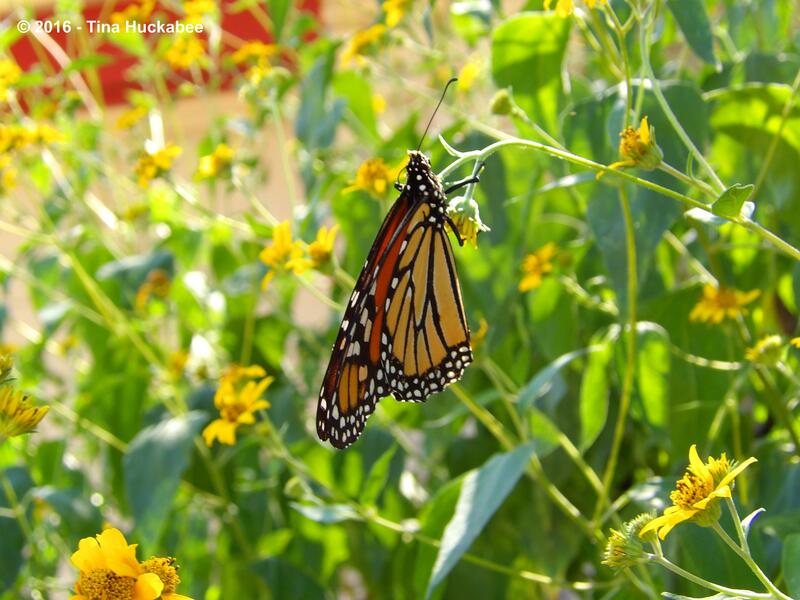 Important for pollinators, migrating birds, and other wildlife, Texas native plants are easy to grow, conserve water, and define place: native plants make the Texas natural landscape, or your cultivated garden, special. Yellow is an autumn thing here in Texas. Native Yellow bells, Tacoma stans shout golden goodness with masses of trumpet blooms–and the pollinators are appreciative. The Texas craglily, Echeandia texensis, sports sweet flowers along 2 to 3 feet bloom stalks and blooms well into November. 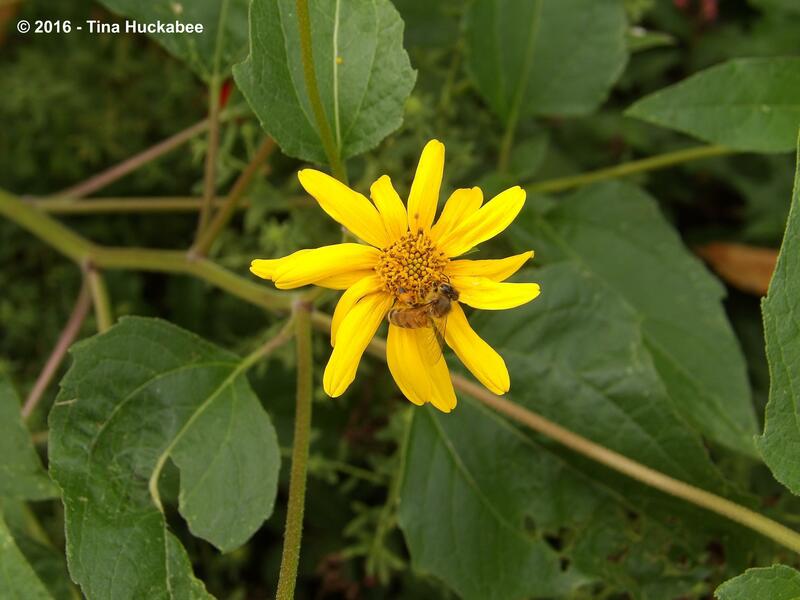 Zexmenia, Wedelia texensis, is a native flowering groundcover which graces any garden with loads of nectar-filled daisies from May through October. 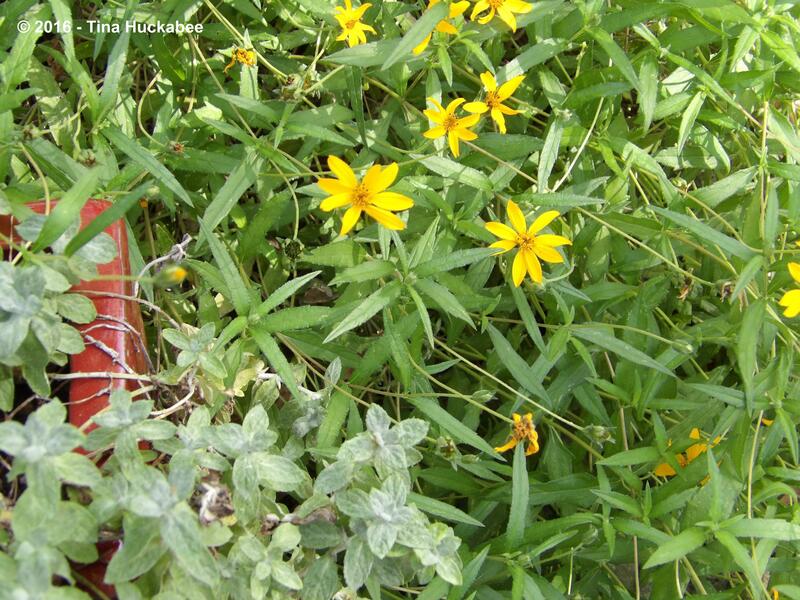 Zexmenia paired with another native groundcover in a container, Wooly stemodia (Stemodia lanata). Zexmenia planted with Twistleaf yucca (Yucca rupicola). 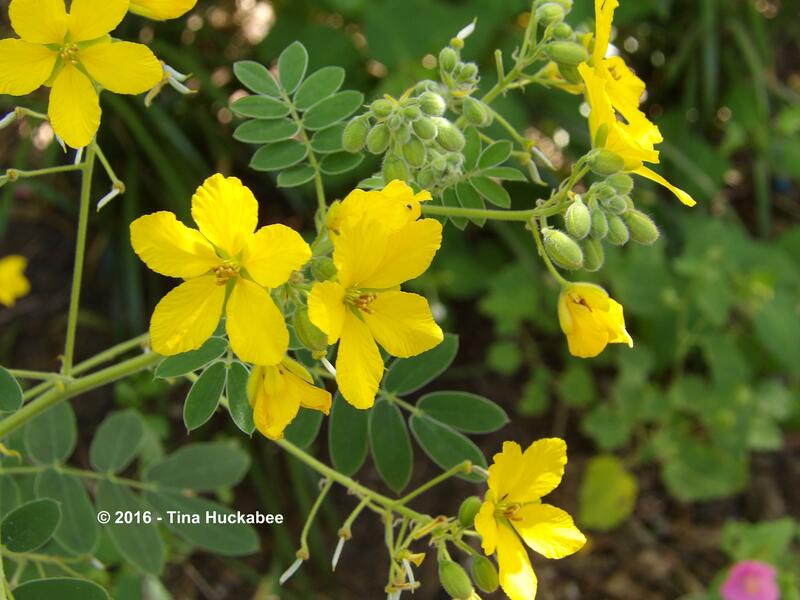 Sometimes called Puppy-dog ears because of its soft foliage, the Lindheimer’s senna, Senna lindheimeriana, rock cheery flowers which are native bee magnets. 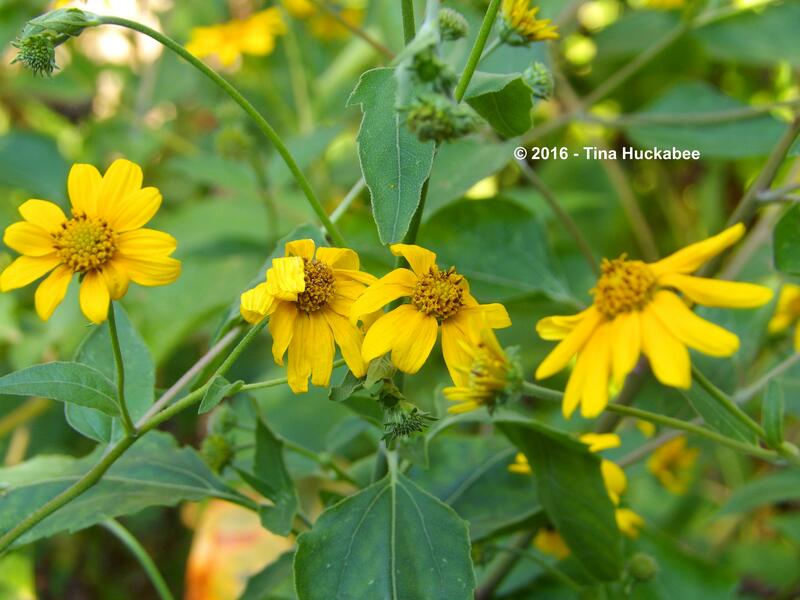 Plateau goldeneye, Viguiera dentata, brighten Texas gardens and wild spaces with a blast of fall sunshine. …once the blooms are spent, native finches and warblers gobble the seeds throughout winter. Lauding just a few of the native bloomers from my garden, I’m also enjoying Garden Bloggers’ Bloom Day with Carol at May Dreams Garden. Join in, share your garden pretties (native or not! ), then click over to her lovely blog to see and learn about blooms from many places. 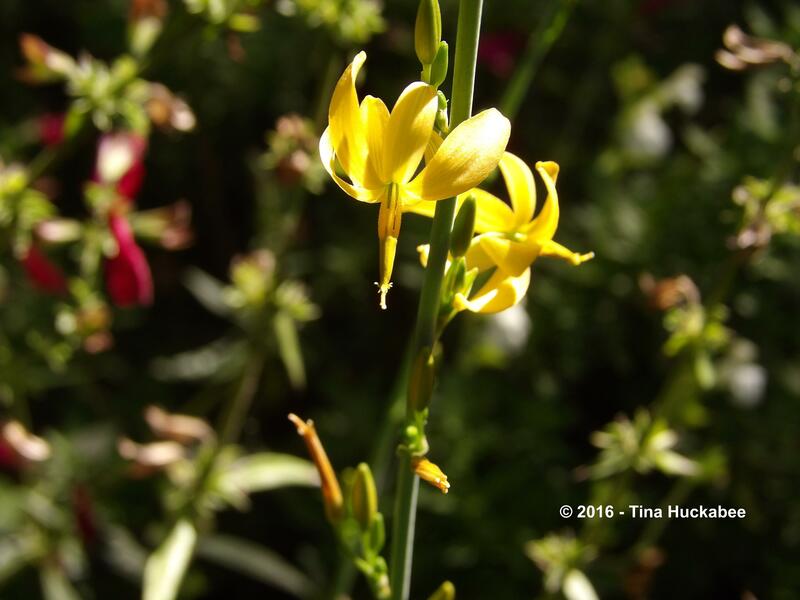 This entry was posted in Lindheimer's senna, Plateau Goldeneye, Texas Craglily, Texas Native Plant Week, Uncategorized, Yellow Bells, Zexmenia and tagged Garden Bloggers' Bloom Day by Tina. Bookmark the permalink. Beautiful golden tones, Tina! Happy GBBD! Thanks, Beth! Happy blooms to you, too! Great to see plants that would never grow in England although each year is getting warmer! Thanks, Steve. You’re right, every year is warmer and who knows what you’ll be able to grow! Fall is a great time in Texas with so many plants in bloom. Your garden is looking great! Thanks! I agree-fall is a wonderful time of year. Beautiful flowers. 🙂 You’ve got quite a lovely display there. Fall is our second spring–and very welcomed! Love all the pretty blooms – especially the Cragily and the “puppy ears”. The lily reminds me of our native Dodecatheon, but yellow, and much larger. Happy second spring, and Bloom Day, Tina! Happy blooms to you, too! The Craglily doesn’t show its orange tint in photos as much as I’d like, but it’s a real winner! Tina que suerte en Texas. Poder tener el jardín todo florido y hermoso. Es precioso¡¡¡¡¡¡¡ Me encantan todas sus plantas, pero la Tacoma stans con sus grupos de trompeta de flores amarillas es maravillosa. Feliz Floración. Saludos de Margarita. Happy Bloom Day to you too, Margarita. 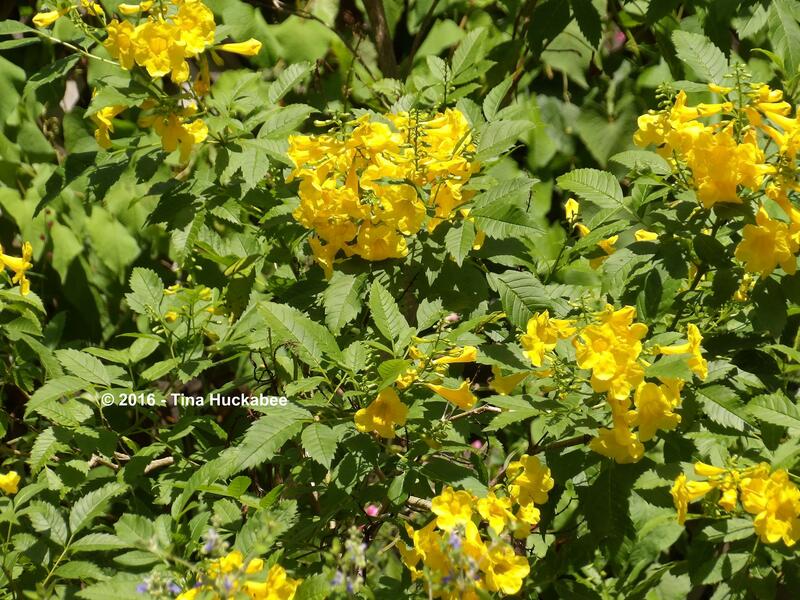 I agree that the Yellow bells are great–so lush and lovely! Tina es una planta especial. Tan bella y de Texas. Y les encanta a las abejas! Qué más se puede pedir¡¡¡¡¡¡ Su jardín es precioso y florido. Enhorabuena Tina. Saludos de Margarita. I’m traveling, and have spent the past week in Arkansas, where it seems yellow is the name of the game, too. The goldenrod seem determined to take over the state. I’ve never seen so much — it’s everywhere. I think some of it must be S. altissima, since there are stands of it taller than I am — some six feet and more. There’s another lovely sunflower-like bloom everywhere. I’ve not ID’d it yet, but I will. In the meantime, there’s broomweed galore. Such a festival! Yes, I read the post about your trip–happy and safe travels! I was also out of town recently and like you, saw some lovely goldenrod. It’s a nice time to see autumn blooms–enjoy! What lovely blooms to still have around. I like the different textures and shapes of the petals. Great variety. Thanks Betty! It’s a nice time of year here in Texas–I always appreciate it after our long summer! Beautiful and soooo inviting! We are really winding down here in Wyoming. I cleaned up my wildflower beds this weekend–pulled up annuals, cut back perennials–and didn’t find a single bloom. Time for snow flowers I guess. Thanks, Hollis. It’s very warm here–we went straight back to late June!! Snow flowers sound nice!